3D printer improvements: How fine can an Ultimaker print? 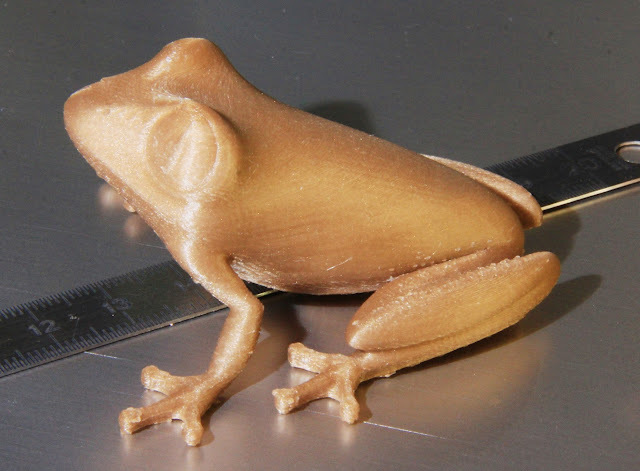 The frog was sliced with 0.075 mm layers (75 microns) and a 0.4 mm nozzle (see here for more about nozzle diameters and a 0.3 mm review). It takes ages to print below 0.05 mm (50 microns), where hardware factors and the smallest calibration errors tend to make worthless... Here it did not take that much time to print (it's mostly hollow), something like 30 minutes at 60 mm/s. The slower you will go, the better the results (usually), and 60mm/s is quite slow for an Ultimaker. My configuration was probably very slightly over-extruding as there are a few blobs on the legs, but I got a nice feedback from my friends (which know about industrial filament-based 3D printing). Printing that thin with wood makes no sense because of the much higher roughness of the material. Finally, I could print it in white PLA, because the details and layers seem to vanish with this specific color and material. And this is the limit of my macro setup but it shows how large is half a millimeter at this scale! 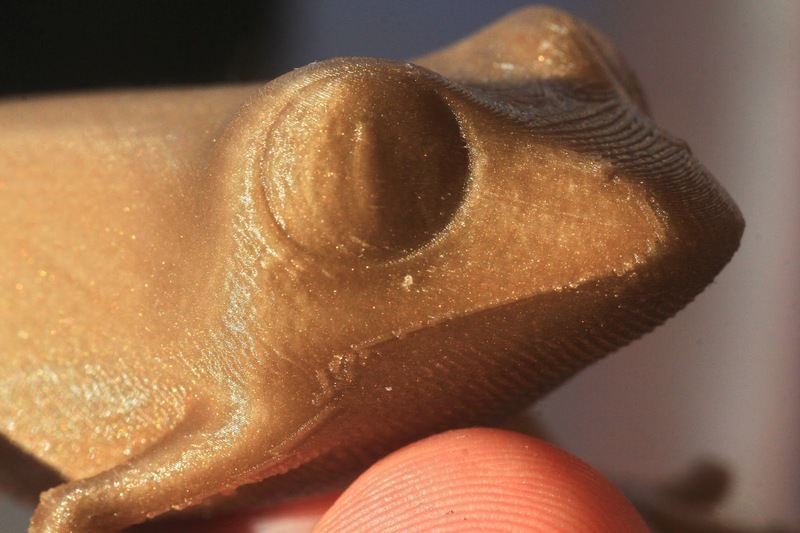 There are interesting slight wavy patterns that develop on the side of the frog, which are not related to the layers but that does not look like the usual resonance waves that we see when the belts are not tight enough. There is no specific direction and no reason for a brutal change of direction in the part of the object, and it does not look as bad as usual (though it is certainly a hardware issue). I did not get the effect on other parts of the frog. Off-topic: what about other printers ? I don't know if other hobbyist printers may achieve this precision. The mechanical structure of the Ultimaker is really well done, where the head is light, the case is sturdy and the bed only goes down. 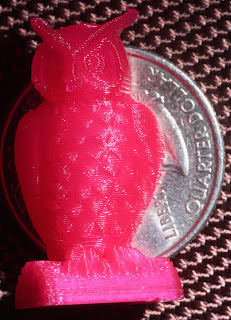 Here are pictures of another print (Cushwa's owl again). 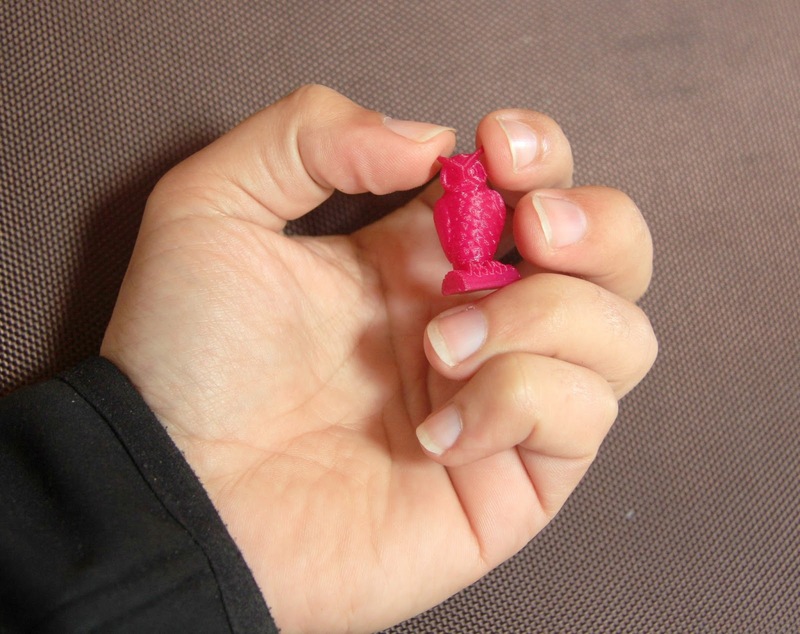 It is 3 cm tall and was printed with 0.04 mm layer thickness (40 microns). 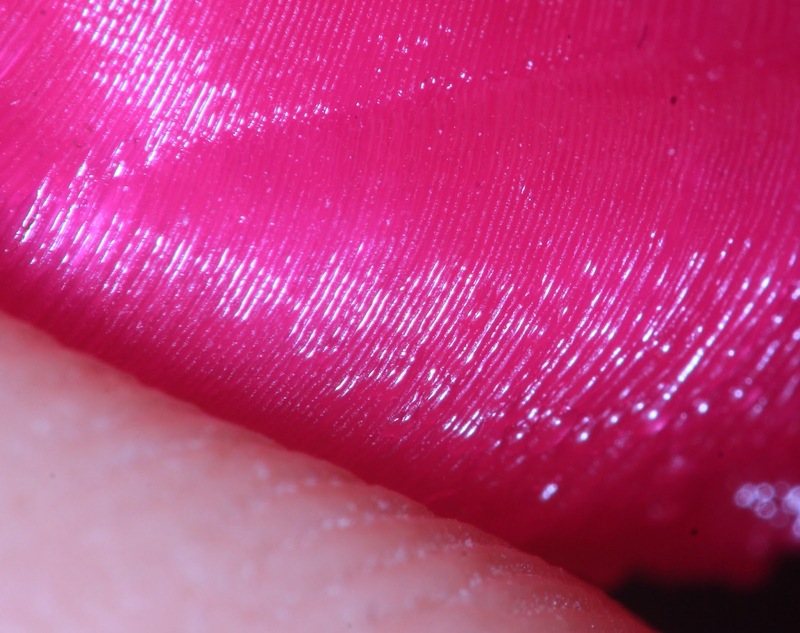 Check my fingerprints for a scale in the closeups! 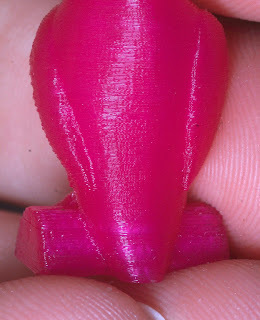 I find this shiny pink/red PLA is impossible to shoot correctly and better would stop using it as a showcase! Strangely, the (ugly) color do change a lot from the real one! I never had such an issue in years of photography nor with other plastic of mine: could this material shine so much in the IR or UV range that it completely offsets the camera sensor or post processing software? Strange but nonetheless interesting. Update: thanks Adam for pointing out that it probably comes from Red/Magenta abusive saturation due to the automatic white balance of my camera - too bad I can't fix myself, as being a bit colorblind does not help me finding it out! For more information, you may like to check my feelings about the pros and cons with a smaller nozzle. Its really amazing. Liked it. Include a pic with the frog on your hand, so we can get a feel of how big it is, without resorting to getting my own ruler. It seems to me that the ripples on the side of the frog may be caused by some effect occuring in multiple consecutive layers at slightly different points, causing an accumulated ripple. I've got no idea what effect might have caused it though. Well, I just forgot the "human" scale indeed... and the frog's gone! It could be strain relief also due to accumulated pressure. One day I shall conduct a systematic study of the effect of slight under/over extrusion in this respect.